New feature download snap in Configuration – Options – System. Snaps are downloaded from mega server and copied to the regamebox snap folder. highres themes stays after reboot. Bugfix on wifi disable. All netctl connectors are now deleted. power the tube. If you are not sure what you are doing find a tv tech. 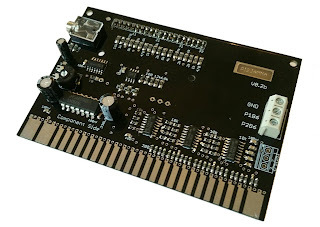 The pi2jamma / pi2scart is designd for 4:3 crt screens. It is possible to use 16:9 but you wil get black bars on the left and right side of the screen. Retrogaming is designd for 4:3 aspect ratio. 2 options: go to the menu of the tv and search for the tilted option. Or, the yoke of the screen is not correct. Check the settings of the color/crt and the image. pi2scart/ pi2jamma is designed to provide a picture clear image. My image is out of bounds of my creen. second you can enable overscan and push the screen around. you don’t have to start with 16, you can play around with the settings. You are also able to only push from one side. if you # comment a line then the linux will not use it. in this case it wil only use overscan from the left. The Regamebox Distribution grows and grows, so time to explain the game controller features in detail. If you want to go in the retroarch menu interface, then connect a keyboard F1 and use Arrow Keys, Backspace and Return for navigating. Ok, now you have a Pi2scart and want to use USB Gamecontroller. First you have to turn the pikeyd165 driver off. In version regamebox v2.3 is doing this for you. It has a automatic detection, to turn of pikeyd165 driver if no pi2jamma is connected. Take a look at parameter pi2scart=”A” in config file /boot/regamebox.conf or on USB Stick folder. On other distribution, check how pikeyd165 can be turned off. Just leave it as it is. If no usb gamepad is connected it works as keyboard with above key setting. For configuration a keyboard is needed. For retroarch the automatic gamecontrollers are installed. So your gamecontroller should be recognized automatically by retroarch or its not supported. Retroarch auto settings are used for the gamecontrollers. This simply means if you change automatic basic controller settings, then you will face issues. Use the remap function to change specfic game controller mapping. Find the remap feature in retroarch menu – quick menu – Controls. Change your settings, save game or core override and exit and start game again to take effect. Make sure that save on exit activated and Remaps Bind Enable is on. Preparation : Check if save on exit is enabled. – file system reworked with new partition for roms. Some bug fixes, 2300 remap files for fbalpha, usb gamepad support for frontend, extra button layout for 3, 4 or 6 button cabs and enhancements of the backend like file system extension, gcc, libs, python pygame support and more. I’ve put some helper tools like notepad++, winscp, putty, Linux Reader, paragon and win32diskimager to the release. You might find it useful. Just added a controller remaps instructions for retroarch. Find it in the tutorials. The documentation page for the project Pi2Jamma is online.